Its happened to all of us. One slip off the counter or a fumbl-y fall out of our bag and WHAM! Our perfectly pressed powder or all-time-favorite eye shadow in it’s barely-a-week-old compact is now in tiny crumbly pieces. Our face immediately crumples right along with it. 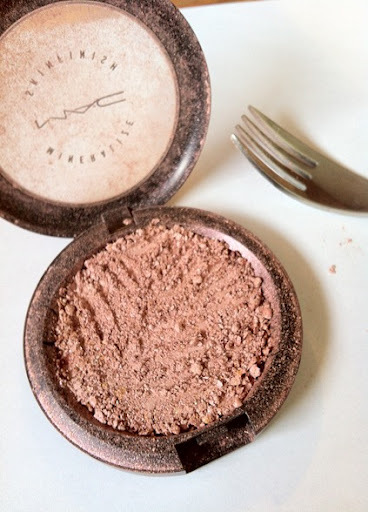 Yes, there are other things that out far more frustrating, however thanks to seeing our favorite (and pricey) makeup staple wasted all over the floor, it takes the cake at that precise moment. Now its time to grab the dust pan, toss the compact, and pay (yet, again) for a new one. Beauty budget blown and the day is now ruined. Period. Or IS IT? Thanks to this little trick you can save your powder AND your hard earned cash! Ready to fix that pressed powder blitz? Then Lets Do The DIY Thang, shall we? Grab your compact, some plastic wrap, an eyeliner brush, 70% Alcohol, tweezers and an eye dropper. First open the compact and cover the crumbled powder side tightly with plastic wrap. Then smash the remaining powder with the back end of the tweezers so it’s all mashed rather than in clumpy broken pieces. (We know, it seems counterproductive but trust us, you need to make the all of the pressed powder into loose powder again for this to work) Next, remove the plastic wrap and add the alcohol via the eye dropper to the powder. You’ll need at least 10 droppers full, maybe more but you be the judge when looking at the size of your compact. Once the powder has a more sponge-like and pliable texture, use the back end of the tweezers again to smooth the powder back into the flat cohesive texture it was when purchased. Then use the eyeliner brush to smooth the edges or a Q-tip for extra smooth perfection. Let it sit for a few hours to fully dry and VOILA!!!! That compact is now back to it’s newly purchased fashion and you’ve still got that hard earned cash in your wallet. The coolest part of all of this? It works with dried out cream shadow, concealer pots and gloss tubs TOO!